I want to take back all the bad things I ever said about p910nd in the past. Since I could no longer get the NSLU2 and I really needed to buy print servers, I decided I'll give p910nd one more try. I realize I could use CUPS with OpenWRT, but to run CUPS, I need two USB ports (one for spooling and one for the printer itself), plus the real reason is I have little experience with OpenWRT. So I went out and finally bought a ASUS WL-520gU. 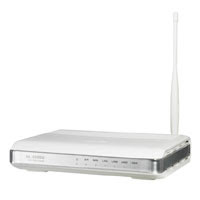 The reason I went with the WL-520gU is because it's really cheap so if I couldn't get printer sharing to work, at least I could use it as a spare wireless router. The WL-520gU works with either Oleg's firmware or DD-WRT, both of which have built-in printing support via p910nd, but I decided to try Oleg's firmware first because it's written with ASUS routers in mind. So after powering it up the WL-520gU for the first time I immediately loaded it with Oleg's firmware, and plugged in my printer. I set up IPP printing and tried a test page, and garbage came out. Imagine my disappointment, but I tried printing from another computer, and it worked perfectly. Huh? Tried again on my computer, garbage again. Tried from a third computer, worked perfectly again. After scratching my head and printing countless sheets of garbage for an hour, I noticed I had chosen the wrong printer driver on my computer. Doh! After changing to the right printer driver it worked beautifully. This is nothing like the bad experiences I had with the countless other USB print servers I've tried before. I've searched for a good USB print server for a long time and was never able to find one, so I've always bought printers with built-in LAN ports. 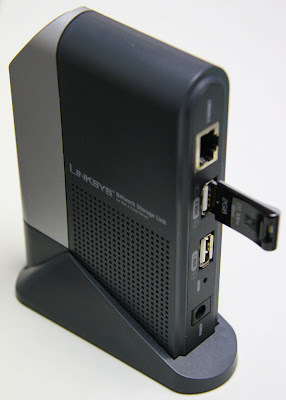 The final straw was the Linksys PSUS4 that was recommended by my network dealer, was really expensive, and stupidly enough didn't work with any printers I have. That's why I was so excited with the NSLU2 + CUPS earlier, because CUPS worked so perfectly. But I'm so happy that the WL-520gU + p910nd combo also works perfectly. I used it in production conditions with multiple LAN users printing from different operating systems, tested it with paper out conditions, as well as continuously sending print jobs while the printer is in offline or error conditions. It all works perfectly. Surprisingly enough, I also tried enabling autopower on my printers, and it handles the autopower on and off perfectly as well. I went to see the Traces of Siamese Smile art show at the Bangkok Art and Cultural Center^H^Hre in downtown Bangkok. Took me a while to find the website since they used a British spelling for the name. The exhibition officially started at 7 PM yesterday. I had to walk to the exhibition center since traffic was at a complete standstill. When I arrived at the center I found out that the roads were closed because a member of the Royal Family was there to officially open the exhibition to the public. Most of the art work was way over my head, but there's one that really stood out for me. 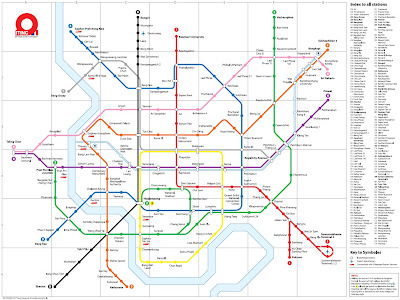 It's an imaginary map of how the transportation system of Bangkok should have been, if everything had happened as the government had promised. Don't let the image fool you. The Suvarnabhumi Airport Rail Link (red line a.k.a. SARL) and the Sukhumvit (dark green) line extention to Bearing won't be completed in another few years. The last two stations on the Silom (light green) line have been completed since 2004 or so but has not yet been opened for use. They're just sitting there gathering rust. Oh wait, if you thought the BTS and MRTA are ridiculous, wait until you read about the stillborn BRT (Bus Rapid Transit) system. 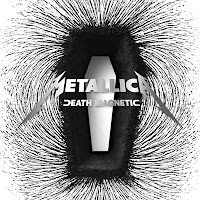 I was so busy working the past few weeks (plus being so depressed over not being able to buy any NSLU2's and having my AdSense account disabled) that I didn't even notice that Metallica, my all-time favorite band, has released a new album: Death Magnetic. This is one of those few times that I found out something by reading the newspaper instead of reading it online. Even the local newspapers have articles about the new album. So I went online to read some reviews, only to find fans enraged over the sound being clipped on the CD, but not so in Guitar Hero 3. There's even a petition for the studio to re-release the album. Today also happens to be International Talk Like A Pirate Day, I know what I'm gonna do while waiting for the album to be released to the stores locally. Arrr! 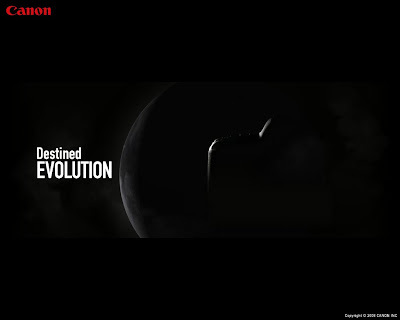 The EOS 5D Mark II is released, and immediately, all the popular web forums are flooded with messages of how lame the new camera is and what Canon should have done. To me though, the single most important thing in a digital camera, SLR or not, is the sensor. In the olden days of film cameras, you had to buy different film to get different ISO levels or to achieve different looks (such as black and white or fluorescent light films), but with a digital camera, you can just turn the ISO dial and adjust the white balance. So to get a different "look" or to get higher ISO levels means buying a whole new camera body instead of just changing the film. Both the 5D Mark II and the previously announced 50D have improved sensors with higher sensitivity and more megapixels (however, more megapixels is not always better). The other improvements in the body such as better looking LCD, somewhat improved interface, automatic sensor cleaning, or even HD video, are just bonuses that are nice to have but have no effect on the image quality. I'm very happy with my 30D right now, but the 50D had me drooling all over it just because of the new sensor. I'm also drooling all over the new EF 24/1.4L II lens. While going through our records recently, we found that your AdSense account has posed a significant risk to our AdWords advertisers. Since keeping your account in our publisher network may financially damage our advertisers in the future, we've decided to disable your account. Please understand that we consider this a necessary step to protect the interests of both our advertisers and our other AdSense publishers. We realize the inconvenience this may cause you, and we thank you in advance for your understanding and cooperation. Although the mail was incredibly vague, I immediately went to the URL in the mail and filled in the appeal form. A few minutes later I received a mail completely written in Thai saying that Google will be closed until September 24. (?!) So instead of seeing the ads there will just be blanks where the ads used to be. Was it due to people clicking on all those Scientology ads? Since my NSLU2 + CUPS experiment earlier turned out to be so successful. I decided to get a whole bunch of NSLU2's to be used as print servers and for playing around with. One of my HP JetDirect cards happened to fail while I was experimenting CUPS so it was all good timing. Unfortunately, when I went back to my network shop, they told me that they only had two NSLU2's. I had bought one earlier, and they had the last one and there will be no more, ever. They even claimed that the two they had were leftover stocks from years ago. One of my NSLU2's with a 2 GB Kingston DataTraveler Mini Slim sticking out the back. Watching the PAD protests on the streets of Bangkok is like watching the world's largest soap opera, except it's all happening in real life. Two years ago, mass protests against the then prime minister Thaksin started because he sold shares of his company to Temasek tax free. Hello? Buying and selling stocks has always been tax free in Thailand. Thaksin is the owner of the company, so he has the right to do whatever he wants with his company. This year, mass protests against the current prime minister Samak started, uh, because the demonstrators didn't get who they wanted as the prime minister the last time around. How to get the prime minister to step down? Blame him for hosting a cooking show! PAD apparently stands for People's Alliance for Democracy, I tried searching for PAD on the net but couldn't find anything useful. There are supposedly official websites and forums, but they're filled with pop-up ads and iframe viruses, which makes their official status somewhat questionable. 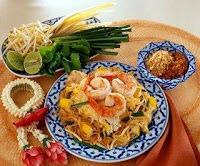 I did get a lot of hits for Pad Thai though. 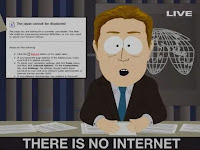 One day last week we lost all Internet connectivity. All phones in my office rang simultaneously and angry users started pouring into the computer room. I called my ISP and they said all Internet is down in my area. They're already working on the problem and will send me an SMS when the problem is fixed, but I should notice it anyway when my connectivity is restored. A few moments later, my boss stormed into the computer room and yelled at us to fix the Internet. The Internet eventually got fixed about four hours later, and the ISP sent a message on my phone the next morning to inform me that's it's fixed. Afterwards though, I noticed that a lot of websites are no longer updated. I know that due to Internet censorship here in Thailand, a huge number of websites are blocked from being accessed. But the new blocking works as if the websites are now frozen in time, and all data are being pulled from the caching proxy instead of from the actual website. It's probably related to the web censorship that happened last week. Besides computers, my other passion in life is photography. I first got interested in photography by random chance when the college that I went to study computer science at also turned out to be one of the most respected photography schools in the world. Unfortunately most of the photo majors I encountered at the time were equipment snobs and I never learned anything, but I could see that if I ever got the chance, photography was something that I really wanted to learn more about. When I got to know my girlfriend (now wife), it was also random chance that her dad (now my father-in-law) is a professional photographer. I told him that I went to a photography school but learned zilch. He jumped at the chance to teach me, so I learned about films and apertures and shutter speeds and composition by using his Nikon FM2. Soon afterwards I managed to buy my own FM2 from some kid who said she was switching majors and was trying to sell her camera to an equipment dealer. The dealer gave her a really bad price when I just happened to walk by, so I immediately offered her a higher price and bought the whole set off her. A few months later, my father-in-law (I got married!) got a Canon EOS 1V to take advantage of faster shooting speeds (10 fps with the motor) and Canon's far more extensive lens selection. Around the same time, someone wanted to buy my Nikon D70 so I jumped at the chance and sold the Nikon kit and bought a Canon EOS 30D with a really nice 17-40L lens. A few weeks later when we got a chance to meet, I found out more about how his 1V was damaged. The 28-70L lens was mounted on the 1V at a shoot, and the equipment handling guy didn't secure the hardware properly and everything fell from the equipment truck, and the 1V got impacted right where the camera body joined the lens. The lens got broken in half near the mount, and the camera's mount was damaged beyond repair according to his Canon service center. 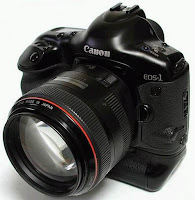 Since he had already bought the 5D and a new 24-70L lens to replace the 1V set, I took the damaged camera and lens to my Canon service center to see if they could do anything about being beyond repair. My Canon service center fixed the 1V for free, and gave me a brand new 24-70L lens. I tried to hide the 1V and the new lens from my father-in-law, but he found out about it so I had to give him my new 17-40L lens in exchange for the much more expensive 24-70L lens, plus I had to give the 1V back to him too. Of course, we still have our collection of old bodies and lenses, but it's no longer easy to find labs that can handle film properly. We would sometimes take the old FM2 out and shoot a roll, but more megapixels is where the world is headed to. With all the excitement over the release of the Google browser, no one is paying any attention to the new Picasa release. I really like both Picasa and Picasaweb and I've been using Picasa even before Google bought them. Did you know that Picasa is named after Picasso? Speaking of Picasso, here's a Picasso-related clip. Google Chrome is now available for download. Many sites are linking to the wrong download page. A lot of my time is spent on Google and Google Apps. 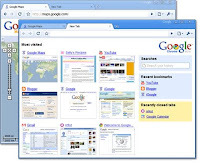 So it's really good to hear that Googles is making their own browser. The Official Google Blog has more info about Google Chrome. I actually use both Firefox and IE, maybe Chrome will be good enough to replace both of them? In fact, I was cursing at Firefox because it doesn't seem to format the interface for CUPS properly when I heard about Chrome. Can't wait to see what comes tomorrow.